1-Bromo, 3-Chloropropane - Mody Chemi-Pharma Pvt. 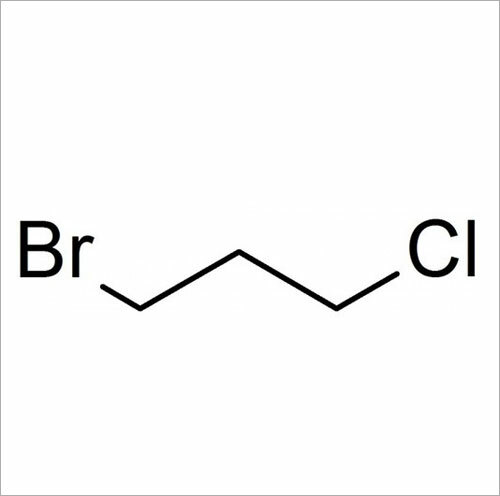 Ltd.
1-Bromo, 3-Chloropropane is also known as Propane, 1-bromo-3-chloro-, Trimethylene chlorobromide, 1-Chloro-3-bromopropane, 3-Bromopropyl chloride, 3-Chloropropyl bromide and has Molecular Formula of C3H6BrCl with Molecular Weight of 157.43674. It is manufactured through free-radical addition of anhydrous hydrogen bromide to allyl chloride as well as can also be made from ethylene and methylene chlorobromide. Available in colorless liquid form, it has Boiling Point of 143.3°C @ 760 MM HG, Melting Point of -58.90°C, Density/Specific Gravity of 1.5969 @ 20°C/4°C with solubility in alcohol, ether, chloroform as well as methanol. Further, it is also soluble in chlorinated and oxygenated solvents.